The sixth annual Be Amyazing Reston Youth Triathlon returns to Reston on Sunday. Registration for young athletes is full, but there are a few logistics to be aware of for spectators and residents. The event begins Sunday at 8 a.m. at Ridge Heights Pool, 11400 Ridge Heights Rd. After the swim portion, athletes will bike down Ridge Heights to South Lakes Drive, then down Seahawk Drive to the South Lakes High School stadium area. Roads will not be shut down. However, lanes will be blocked. 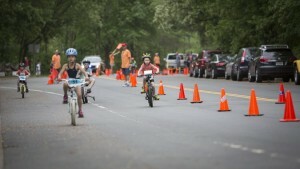 There will be law enforcement helping guide traffic, but please be careful of the kids (ages 6 to 15) on the course. The running portion will take place on Reston Association paths. See the various courses for different age groups on the Be Amyazing website. The triathlon began in 2011, when a group of then-high school freshman (Kacey Hirshfeld, Olivia Wolfe and Hannah Becker) wanted to start an athletic event to honor their friend Amy Boyle, who succumbed to brain cancer in 2008. Proceeds from the event benefit the Childhood Brain Tumor Foundation. The event founders, now college students, were honored for their community service at the 2016 Best of Reston gala last month.